Packing for a winter vacation can be overwhelming. Winter clothes are heavy and take up a lot of space. You have to be strategic and efficient to pack light and not have to pay that overweight fee. Weather conditions can vary. In Anchorage temperatures vary from 12 to 40 degrees Fahrenheit. Be sure to keep an eye on the weather before traveling. To help you prepare, here is a list of 10 important items for your winter travel to Anchorage. Layers are essential to help keep your body warm. Add base layers to your packing. You can start off with a lightweight, long-sleeve top and long bottom. Important additions include a fleece jacket and waterproof/ breathable jacket. To top it off, pack your main trousers and jackets. If you plan on doing any snow related activity, you have to pack clothes that are appropriate for the elements. Insulated and water-resistant options are ideal. There are several options to pick from. The best combination for you might be a pair of overalls and a jacket, or maybe pants and a jacket. Whatever it is, insulation is key for skiing, hiking, snow machining and other outdoor activities. Stay warm so you can enjoy the outdoors during winter. Keep in mind that snow blindness is a thing. Snow reflects a lot of sunlight, which means the intensity of light exposure during winter can be very damaging to the eyes. To help prevent any harm to your eyes, make sure you take sunglasses. If you have a strap for your sunglasses that would be best so you don’t lose them. If you are planning on doing any skiing or snowboarding, or anything high-speed, snow goggles are a must. Not only do they provide full coverage of the eyes, reduce glare and increase contrasts, but they also won’t fall off. To top it off, they protect you from the cold. Snow sports expose you to wind for long periods of time, so the goggles protect your eyes from anything that can impact you from seeing clearly. We talked about the importance of sunglasses due to all the light bouncing off the snow, so it comes as no surprise that sunscreen is another piece of the sun-protection package. Be sure to retouch it every few hours since sweat and clothing can rub it off over time. The winter can be harsh on your skin. Your hands, face and lips are possibly going to get dry, especially if you spend time outdoors. Your skin can get rough and sometimes even putting on gloves can hurt because of that. Pack moisturizer to keep your skin healthy. You need to keep your feet warm, so we recommend wool or synthetic socks, not cotton. Make sure to pack a few so you don’t run out in the event you don’t get the chance to wash your clothes. You can even wear layers of socks or a toe warmer. For staying at home, fuzzy, warm, anti-slip socks are nice. It is not fun to have cold feet for hours. Not only do the boots keep your feet warm and dry, but they also help when walking on the snowy and slippery terrain. If you do not want to buy boots, there are other options. Hiking boots and anything waterproof can be useful. If that is the case, invest in warm socks and those toe warmers. Beanie/ Warm Hat and Headbands: A beanie will help you keep your head and ears warm. There are thin beanies that can go under ski helmets or puffy ones that can be used daily. If you become too warm and want something to cover only your ears, headbands are a great solution. Gloves: You can either go for mittens, regular gloves or both. You even can double-layer gloves. If you need to use your hands and don’t want your fingers to freeze, look for gloves that are compatible with smartphones, so you do not have to remove them while using your phone. For outdoor activities, make sure to take waterproof gloves. Scarves: Scarves aren’t only fashion accessories. They are actually useful to help keep you warm. Whether you prefer the large or smaller ones, have one long enough to wrap around your neck. It is great for the outdoors, windy environment and even indoors. Neck Gaiter: This is extremely useful. The neck gaiter will not only keep your neck warm but helps avoid any throat aches. It can easily be pulled over your mouth and ears if needed. It is especially useful in windy situations and activities such as skiing and snowboarding. We all know how important it is to have a charged and working phone on trips. You don’t want to miss those unique landscape shots or get lost while exploring Anchorage. Cold weather can wear out your phone’s battery faster then usual. Portable chargers will help keep your phone in check, and they are small and easy to transport. Packing cubes are helpful for compressing clothes so they fit properly in your luggage and help keep things organized. You are now ready to enjoy the winter wonderland that is Anchorage. You are welcome to print out this page and check off the items from the list. Keep in mind that ski and snowboard clothes can be rented at the nearby Alyeska Resort if needed! Be sure to check out our map of attractions to plan out your stay. 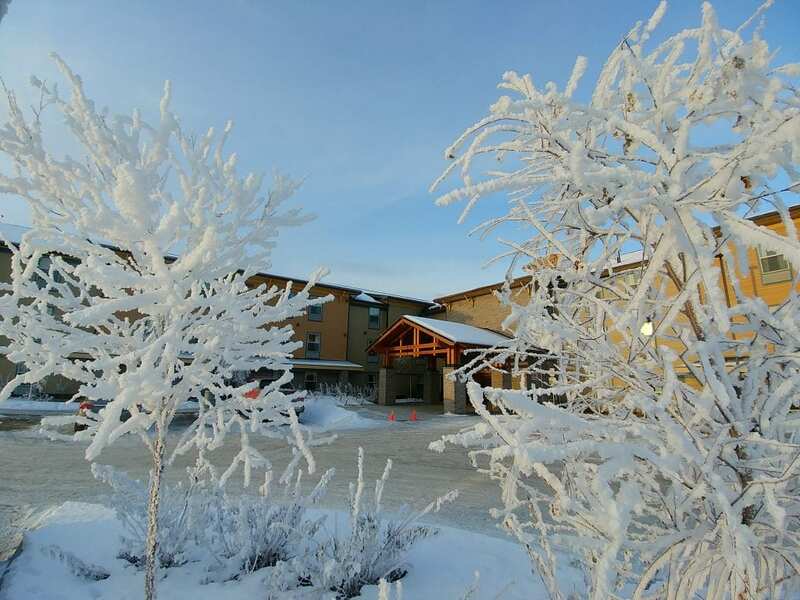 Aptel is located a short distance from many activities and downtown Anchorage. You can find several winter clothing stores close by that can help you check off any missing item off the list. Contact us for any additional information, and make your stay comfortable and convenient by staying at Aptel Studio Hotel.